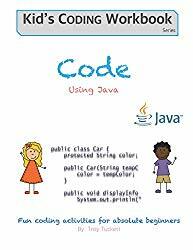 Code Using Java teaches kids to think in a new way. They learn to do simple coding and understand principles that will help them to become competent programmers. The author uses a combination of simple lessons that use examples and analogies familiar to kids, and fun exercises that provide hands-on learning. These things guaranteed your kids will learn and love coding.